A collection of posts about adventures in Kentucky. Typically, I start a hike with a particular milestone in mind. I want to complete a particular trail or log a certain number of miles. Typically, I end up on a completely different path. Kind of like life, right? You start out on a path with your entire trajectory planned – if you’re me, anyway – and end up in an entirely different place. Hike five of my 52 Hike Challenge was sort of like that. It was a breezy Saturday morning. Birds were singing. Curtains were wafting in the breeze. I was blinking into the bright light – of a computer screen. Seeing a creek without being able to get into it is real frustrating. Last Saturday was the first really beautiful day of the year. The temperature made it to 70 degrees, the sun was shining and a perfect breeze was blowing. Why did I shove myself into a corner with a stack of claims to process on such a gorgeous day? Honestly, the prospect of some overtime and extra money was nice. And then the sun lured me outside. But the problem remained: Where should I hike? And then it hit me – like my excited dog nearly knocking the wind out of me when I get home – why not go back and show Kincaid Lake who’s boss? What better way to kick off the warmer weather hiking season and shake off the winter blues than by revisiting the site of my last 2015 hike? The last time I attempted this hike it was in the heat and humidity of late summer … and I forgot water. That hike was doomed from the start. This one was different. I had everything I needed for a perfect afternoon out. Its hard to get a selfie with a tracking dog. Emme and I arrived at the park – with plenty of water and oxygen – intending to hike the same route as last summer. (The same hike that is outlined in the “60 Hikes Within 60 Miles” book.) We started down the hill, me letting Emme take the lead. I have a tendency to wander off-trail, while Emme follows the trail of other hikers ahead of us. Hiking with a hound comes in handy when you aren’t sure which trail to follow. It kind of looks like there’s a trail straight ahead. We decided to follow it and see where it led! Once you get down the hill, you hang a Louie at the creek, following it down to a suspension bridge that separates the stagnant piece you just followed with a much prettier, babbling piece of the creek. When we came to the bridge, the hound wanted to cross so she could follow the hikers in the hills above us. It took me about a half a second to override that decision and take a disappearing trail just past the bridge that followed the creek. The first part of the creek is still and sort of stagnant looking. 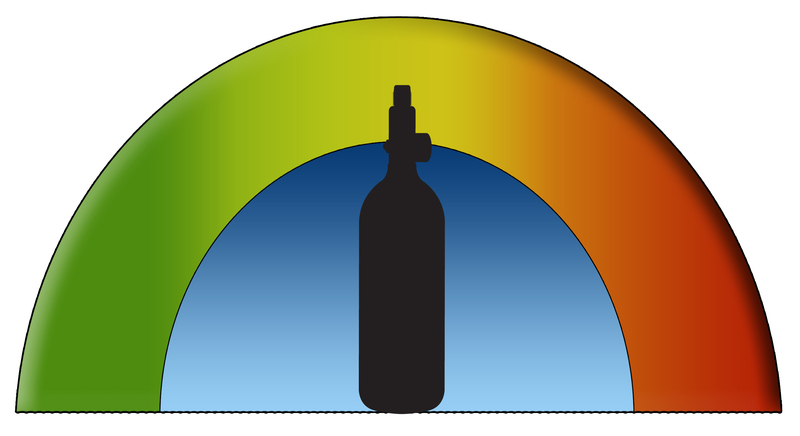 Farther up, it rolls over a rocky portion of earth. We eventually came back out and crossed the suspension bridge. The trail we planned to take went right – following that stagnant part of the creek again before heading up another hill. But going straight took us along the babbling, pretty part of the creek. Guess which way we went? Not exactly a white blaze, but they mark the trail. Kinda. One thing to note about the hiking trails at Kincaid: They aren’t extremely well marked. There are arrows at various points along the trail telling you which way to go, but the trails aren’t often travelled, making it easy to lose track of where you are between the markers. This phenomenon is a little worse right now because we’re still in winter – even if Saturday’s perfect weather didn’t know that. For much of the trail we covered, the only trace of a path was a barely perceptible dent in the leaves carpeting the ground. I could only see it from a distance, and once I started following it, the wind was the only thing guiding me. That’s how I ended up thinking I was all cool, blazing my own trail, only to look a back and realize that I had been following a time-worn trail all along. I didn’t face down my nemesis from last season, but I had a fantastic afternoon trying to not get pulled in while my dog played in the creek like a puppy. While a big part of my 52 Hike Challenge is pushing myself harder and tackling more difficult hikes, the bigger part is enjoying the adventure. Well, my second hike was supposed to be at Shawnee Lookout, but I decided to stick closer to home because of weather and, well, because I just love being able to hike so close to home. Besides, I have a couple of little nooks and crannies to explore before I run out of new things to see at Big Bone Lick SP. For the last year, every time I’ve hiked Big Bone I’ve planned my hikes to avoid this steep, slippery hill. But, like any other bully, it wasn’t as bad as I thought it would be once I finally just climbed it. There was a gap between my first and second hike because of weather, but the little bit of snow and ice leftover was mostly gone by the time I hit the trail. What was left in its place was ankle-deep mud. I spent a few minutes bemoaning this fact before I realized that this mud is going to be my constant companion until July, and then I just jumped in. Even though the snow was gone, it was still freaking cold a couple of weekends ago. I stayed warm enough while I was hiking but when I stopped to change tanks I felt the cold through my sweat-frozen headband. Usually when I hike Big Bone, I take an access road to the bison pen and then take the Cedar Run Trail up the hill to Gobbler’s Trace and back down to the parking lot. This route starts out relatively flat, but takes you up a moderate, yet long, hill before you reach the crest and take a shorter, steeper route back down. There was an intense standoff between Emme and a doe on the trail ahead of us. Fortunately, Emme didn’t try too hard to take off after her and drag me down the trail. I went into this hike planning to hit all four trails in the park: Big Bone Creek, Gobbler’s Trace, Cedar Run and Coralberry Trails, starting with the shorter, steeper hill at the Gobbler’s Trace trail head. This way, I had the worst of the hike over at the beginning. The rest would be minor ups and downs through the woods. Spoiler alert: I didn’t complete all the trails. Did I mention it was cold? It was really cold, about 20 degrees, and windy. It was muddy – really muddy. I would have thought the ground would be more frozen from our January cold snap, but the sun was so warm it thawed everything, even in denser parts of the woods. We were ankle-deep in mud for the entire hike. When it started to snow, I decided I would cut the hike short and head back to the car. 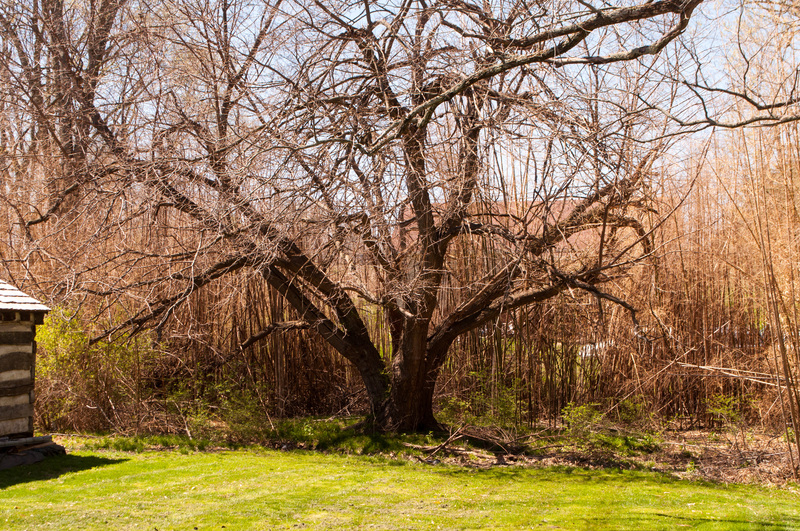 That blood spot and the prick in the middle of it is from a giant thorn – on a TREE! Even though this hike was abbreviated, I still feel fantastic about it. I faced that big, honking hill I’ve been afraid of since my lungs broke, and conquered it with nothing but a very bruised knuckle. When there’s a gigantic tree down across the trail, look out for the giant tree thorns when you’re climbing off-trail. If you don’t, they’ll dig into your knuckle down to the bone. 1 hike down. 51 to go. For more information, visit 52hikechallenge.com. It’s only January 3 and I already have one hike under my belt! Go me! Last night I packed up some oxygen and dug out my neglected hiking shoes. This morning, I pulled on some layers and set off just past dawn for my first hike of the year. And boy, let me tell you, it felt good. There is something about getting the old lungs blown out to make them feel better. Hike one of the 52 Hike Challenge was a half frozen one around Big Bone Lick SP’s sulfur springs and creeks. 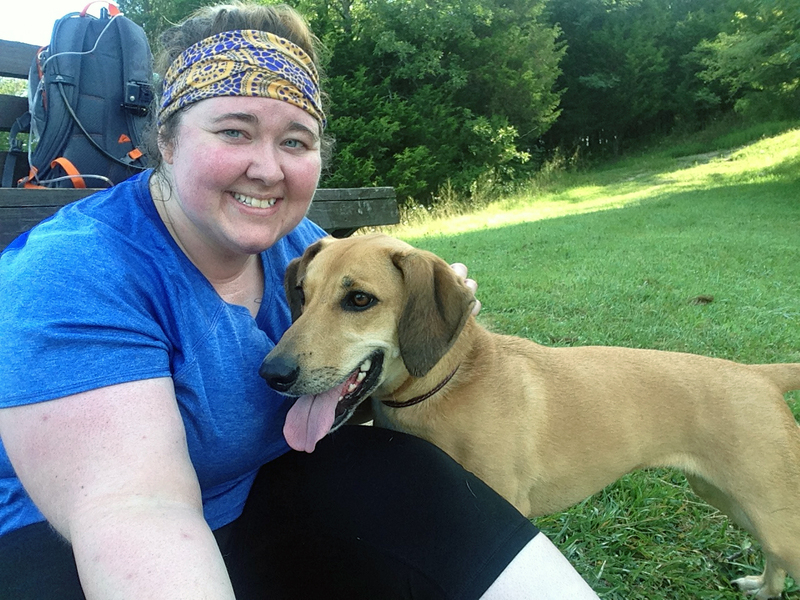 My choice for my first hike was my favorite local park: Big Bone Lick State Park near Union, Ky. I’ve blogged about this park about 47 times in the last year, so I won’t drone on about it again here. I am getting over a cold, so I started out taking the pansy trail, a.k.a. 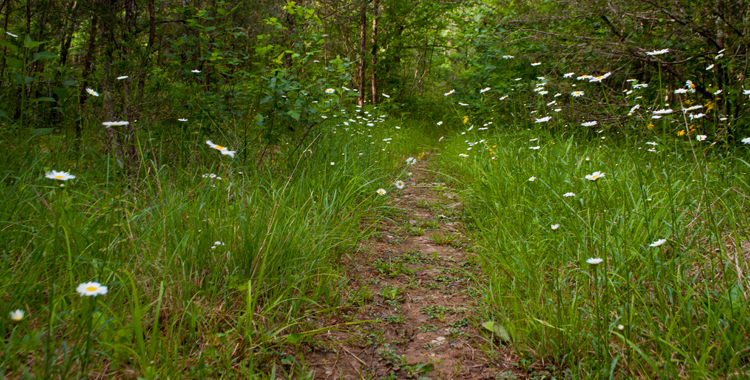 the Discovery Trail, a mile-long paved trail that loops through sulfur springs and bogs. It’s pretty flat and anyone who can walk, or even uses wheels to get around, for that matter, can do it. Except for the sour-rotten egg smell around the sulfur springs, I felt better and better as we walked this easy-peasy trail. So, we veered off the paved Discovery Trail and took the Buffalo Trace Trail, about a half mile of trail that connects the Discovery Trail to a park access road behind the bison pen. The trail meanders along Big Bone Creek, following an old bison migration path still etched in the earth. 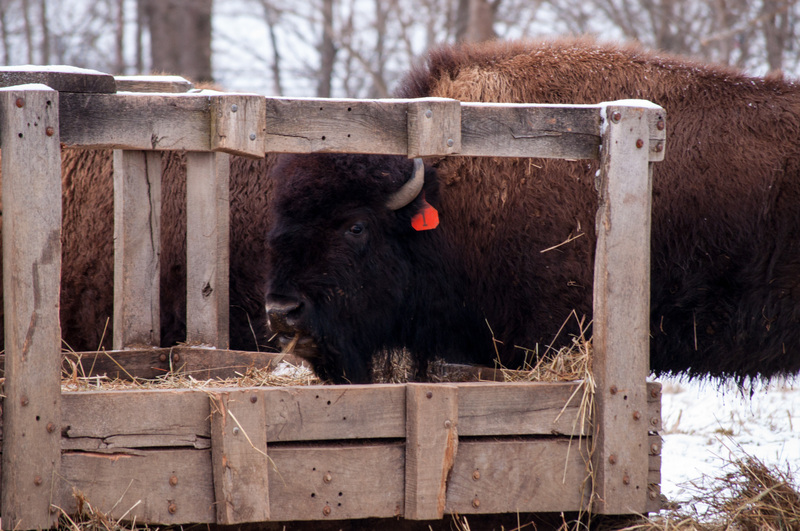 The bison would come down from Indiana, load up on salt, and head back north. Even though the wild bison are long gone, the buffalo clover on the trail remains. The Buffalo Trace Trail is pretty easy – even for me. I’m rating it a two only for the tiny baby hill to get out of it. This was the first time I took the Buffalo Trace Trail, and it was super-de-duper easy as well. I don’t know if wheels could make it, but anyone who can walk should be able to do it. It isn’t paved, but it’s flat and wide, and any roots crossing the path are small and mostly buried. Added bonus: We were so close to the creek that we could hear it running over rocks when my feet weren’t crunching the frozen buffalo clover lining the trail. I give this trail a two on the Gus Scale; it was just that easy. Once you exit the woods, there will be a paved road. To the right is a park residence, but to the left the parking lot and museum are at the end of the road, just up a slight incline. Now, I say slight, but it was long, and enough to get me winded. But, you have an incline to get back up to get off the Discovery Trail as well, so pick your poison. When you’re going up the hill, there will be a gravel drive open up to the right. You can take this to see the bison; they usually graze on this side of the pen in the early morning. If you take this route follow the trail out to the bench, and then you can veer left to keep hiking along the fence line and onto the more wooded trails, or you can almost double back and take the trail through the trees. This will take you right back to the parking lot. I can’t come to Big Bone without a visit to the bison, so I took Emme and headed around the bison pen, but they were nowhere to be found. They had more sense than me and were probably snug in a barn somewhere. Next weekend, I think I’ll tackle the trails through the woods and see if I can pound out a few miles over some (pretty small) hills. Even though I’m not sure I am quite ready for it, the Hocking Hills Winter Hike is Jan. 16. It’s a pretty rugged six mile hike from Old Man’s Cave to Ash Cave. For the event, a shuttle will bring you back to Old Man’s Cave, instead of having to hike the six miles back. The fact that I’m unsure if I can do it makes me want to prove myself wrong. We’ll see. One hike down. 51 hikes to go. Featured image: My favorite thing about Big Bone Lick SP is the bison herd. Big Bone Lick SP gets a four on the Gus Scale. The trails are easy to moderate, with a couple of hills in between. If I don’t get out to Big Bone Lick State Park near Union, Kentucky, at least once a month, I get an itch. Maybe it’s the cute baby bison, maybe it’s the way I can loop around the park 700 different ways depending on my mood. Maybe it’s the light traffic that I – and my dog – both like. Or maybe it’s the lake that we stop at about halfway through the hike. Whatever it is, I haven’t found many trails I enjoy as much as this one that are still close to home. My favorite route to take at this park is by starting down the access road past the museum. The marked trail head is right next to the parking lot and takes you to basically the same place, but you don’t get to go by the entire bison pen. I like my way better because it takes you along the entire bison pen. If you take the trailhead, you may miss the herd because it brings you out to about the middle of the pen. From the access road, take the first left slightly up a hill and soon you’ll see a fence to the right. You’ll recognize it as the bison pen from the signs every 10 feet reminding you that bison are dangerous – a fact that people in parks across the country always seem to forget. Granted, the bison don’t run wild here like they do in Yellowstone. They remind me more of a pet cow than a wild animal, but I know that if they really wanted to, they could charge that fence and it wouldn’t stand a chance. Once you get down the access road and follow the curve to the left, the trail runs along the side of the bison pen. Once you reach the fence, just keep following it. You’ll reach the point where the trail from the parking lot dumps out, follow a bend to the left and go straight for a bit. Once you get toward the end of the bison pen, the Cedar Run trail will take a left up a hill. Up to this point, the trail would have been fairly easy with a smooth, relatively flat trail. Here’s where the hiking begins. The “lake” is more like a big pond. But the lake makes a great place to stop and force your dog to get her picture! Cobwebs. There are a lot of them once you get in the woods. And ticks. I pull three or four off my dog every stinking time we are at this park. The hill leading from the bison pen isn’t particularly steep, but it is long. It took me three or four hikes to be able to get up it without having to stop for breath. 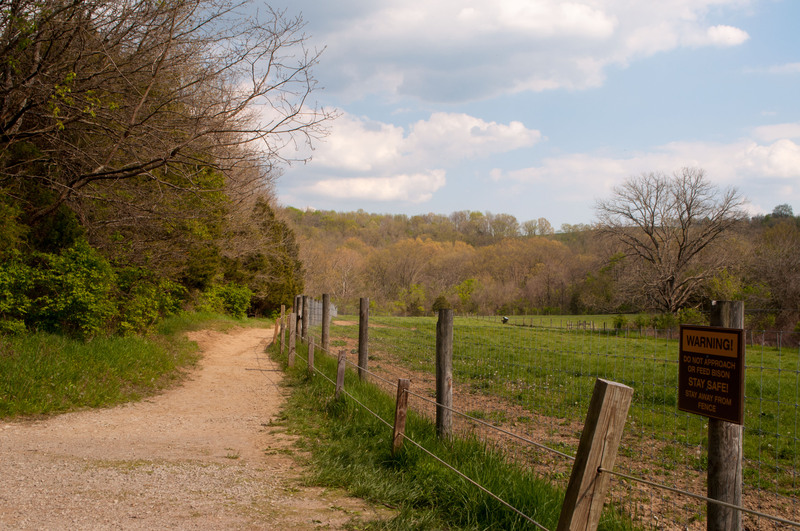 When that hill ends, Cedar Run intersects with Gobbler’s Trace Trail. If you go left, you’ll keep going uphill for a while until you finally start going down a long, mildly steep hill. If you hike this in the rain/after it’s been raining and/or with a dog, be prepared to ski. You can catch Gobbler’s Trace from the parking lot and head up that hill, but I don’t. That hill is killer. If you take a right on Gobbler’s Trace, the trail levels off a bit, but you’ll still be going up and down some moderate hills. When you reach the campground, Gobbler’s Trace ends. You need to keep walking straight to find the trailhead for Coralberry Trail. There may be someone camped in front of it, but it’s across from the dumpster and there is a sign. (I had trouble finding it the first time because there was a tent in the way. 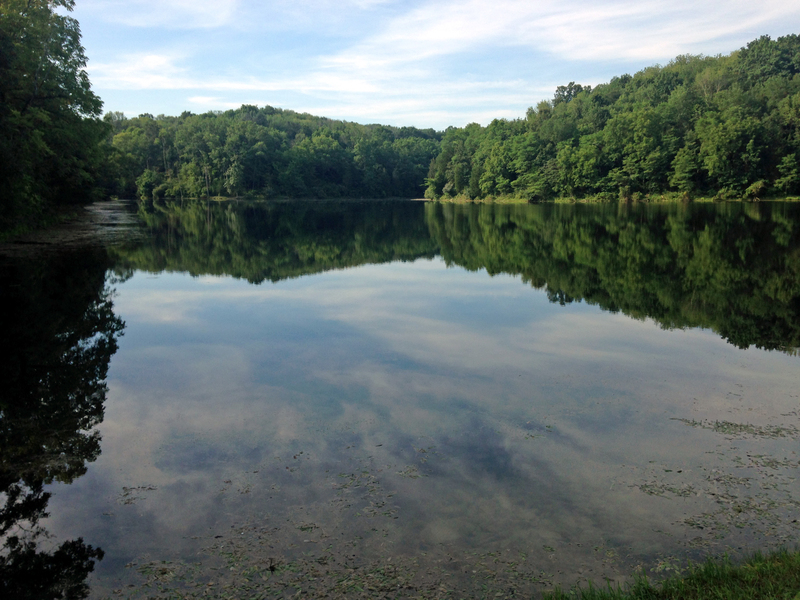 Coralberry Trail takes you around the lake. There may be some people fishing there or a trail runner or two acting crazy (running through the woods is nuts to me). There are benches around the lake and it’s a great place to stop and sit a spell. There are trails that go down the hill on either side of the lake. If you are facing the lake, I take the one to the right because it is more direct. They both lead to a small parking lot at the bottom of the hill. This is a great cheater way if you don’t want/have the juice to trek back through the woods. Once you get to the bottom of the hill, you take a left and follow the road straight back to the museum. It’s an easy walk. 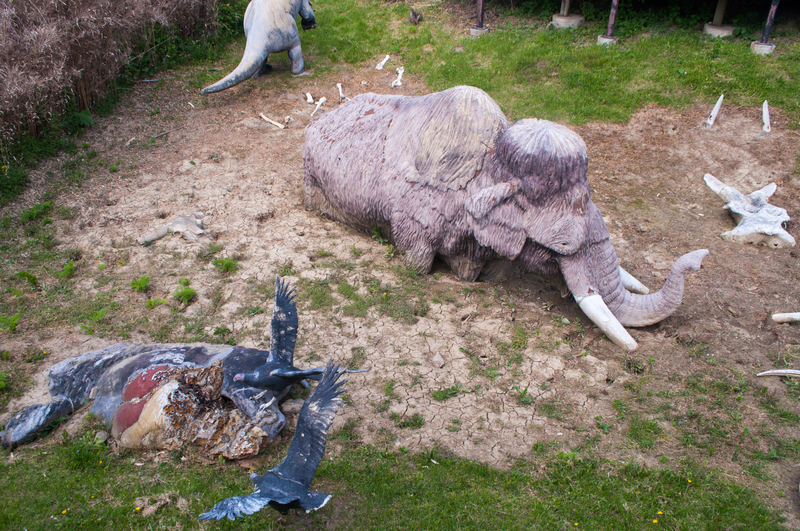 Since all the big bones are long gone from the park, they have displays like this along the discovery trail. I’m not sure if this part is to teach people or gross them out? If you’re looking for something easier or just to add on some miles, there is a paved loop trail that goes out from the back side of the Museum/Visitor’s Center called the Discovery Trail. The trail takes you back through the park’s history and has informational signs along the way. You’ll also pass through sulfur springs, so bring a clothespin for your nose. I just love these kids – but the younger two weren’t as impressed with hiking as I wanted them to be. From left: Mandy, Ella and little Olivia. 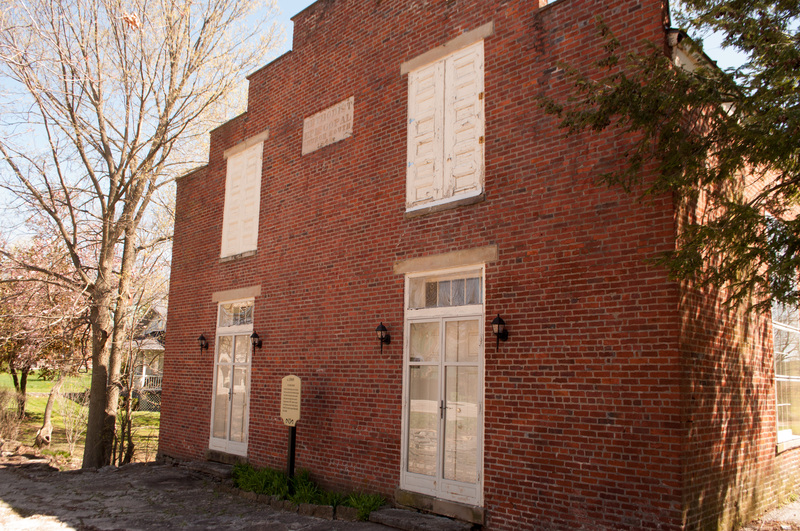 Historic Washington Village, Ky., just south of Maysville, offers a bundle of history, shopping and entertainment. Visitors can schedule a guided walking tour calling 606-759-7411, or take in the town at their own pace, using signs posted throughout the town. Washington features log cabins dating from the 1790s and a stop on the Underground Railroad. The more I explore Kentucky, the more surprised I am by how many very interesting and beautiful things lurk in the next holler. Even though I moved to Kentucky with the intention of only staying long enough to finish my degree, I don’t really ever plan to leave. You know, unless I happen to find a Montana cowboy. I suppose then I could be persuaded to leave my rolling hills for more wide open spaces. Historic Washington isn’t the kind of town you’ll find to restored to a perfect replica of how it was 150-plus years ago, but the imperfections only add to its charm. 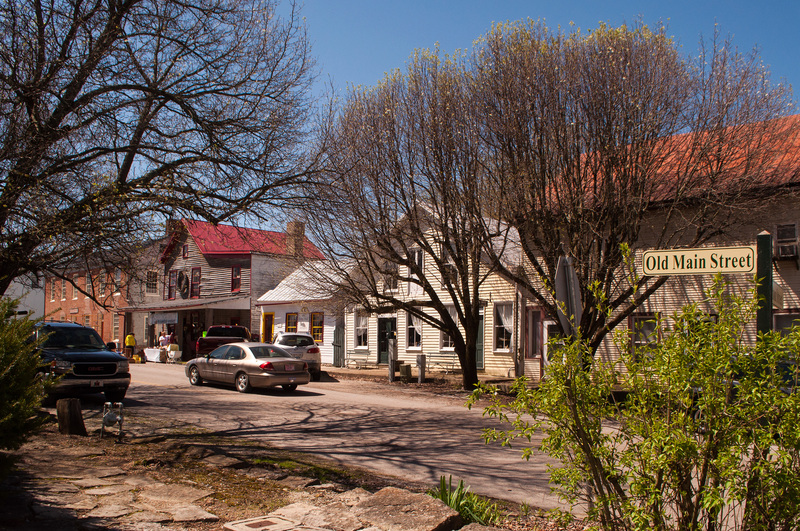 One of the places that inspired me recently was a small village just south of Maysville, Ky. Its store-lined Main Street looks like something from a painting, the sight helped along by the number of period buildings still standing. Washington isn’t the kind of place you go to see something restored in pristine condition – it isn’t that kind of tourist attraction. In fact, it doesn’t feel like a tourist trap at all. Many of the old homes are private residences, and are opened to the public only for certain events. Of the places that are open to the public, they are accessible only on a walking tour through the town. 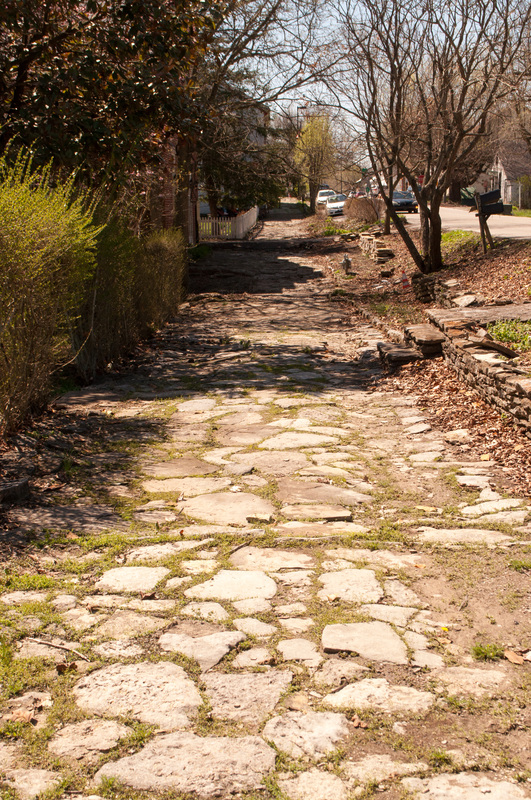 A long stretch of flagstone sidewalks stretch from Mefford’s Fort to the Visitor’s Center. We visited in late spring, when the town was still waking up from winter. There were some vendors on the sidewalk in front of the Old Courthouse Lawn (more on that location later), and more traffic through the various shops than I expected. I can’t say the buildings were in pristine shape, but they weren’t ramshackle, either. You will see some minor wear and tear, maybe a missing or damaged shutter here and there, but all of these things add to the charm of the town. I’ve been to fully-restored historic towns, forced to keep to a certain code so they always look just-so, and they do not have the charm and personality of Washington. When I walk on flagstone sidewalks along Main Street, it’s easy to imagine hearing the clop of hooves on the road. What is harder to imagine is the impact the people of this blip on the map have had on the world. In the beginning, there was an explorer. Many of the first settlers of the village were Revolutionary War veterans. Washington Village, now part of Maysville, Ky., is older than the state in which it resides. 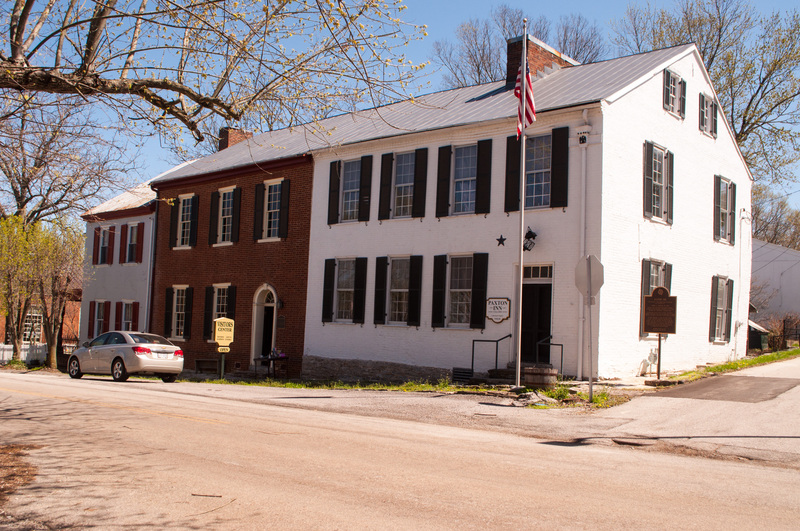 It was one of the first towns established in modern-day Kentucky, one of the first American settlements west of the Appalachian Mountains, and the first town named after George Washington. It’s a whole lot of firsts. 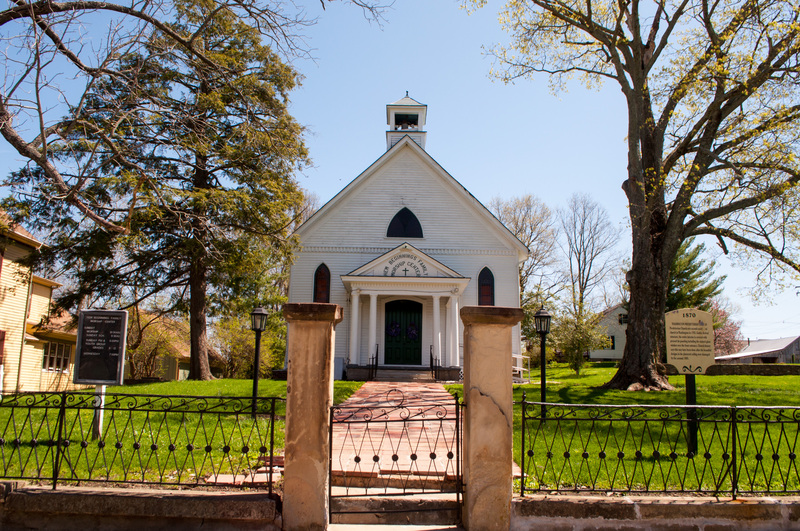 Washington was founded in 1786 by Revolutionary War Veteran William Wood and many of the original settlers were Revolutionary War soldiers, and are buried at the Old Baptist Cemetery just outside town. Fun story: This log cabin used to be a flatboat. And then 13 people lived in it. Its the only known remaining flatboat cabin left in the country. One of the most memorable things about Washington is the number of log cabins still standing that date to the town’s founding in the late 1700s. One of these, Mefford’s Fort, is the last known flatboat cabin still standing. Mefford was in on the whole repurposing trend about 300 years before it was cool. He floated his wife and children down the Ohio River, then hauled the boat about five miles uphill from the river and made a log cabin out of his boat. His wife and 13 children shared this house. All I can say is it’s a good thing they didn’t have indoor plumbing. There would have been bloodshed in that house over the bathroom. 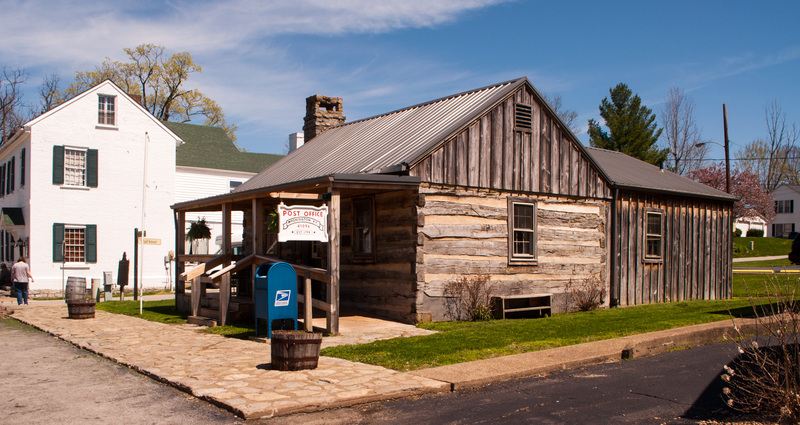 The log cabin post office is the only working log cabin post office in the country. As one of the first settlements, it’s post office became the first established west of the Appalachian Mountains and served the entire Northwest Territory, which encompassed Ohio, Indiana, Illinois, Wisconsin and Minnesota. The original post office was torn down in 1848, but the existing building is the only working log cabin post office in the country. The area used to be filled with cane brakes like this one behind the Bluegrass Artisan Center. 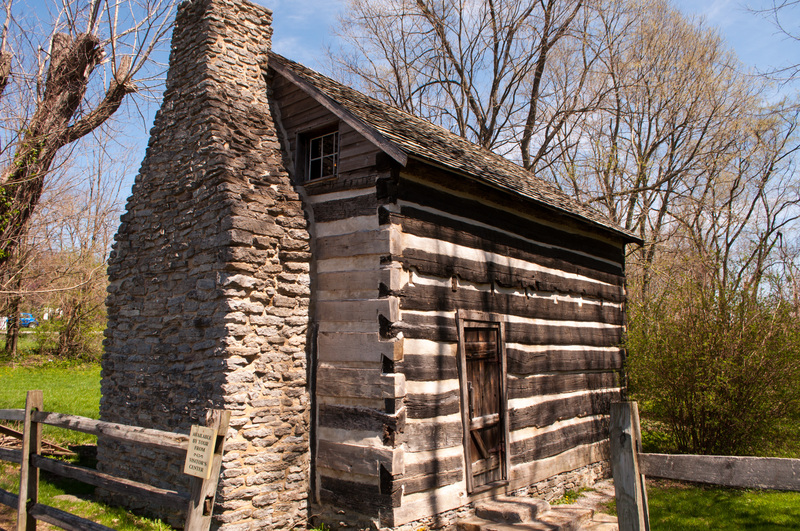 Other cabins in the town include the Cane Brake Visitor’s Center and the Simon Kenton Shrine. 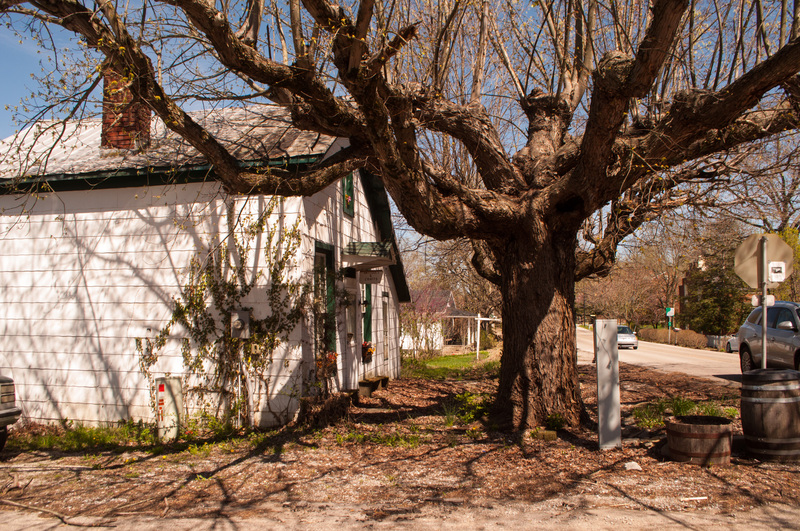 The town’s Visitor Center now occupies the Paxton House on the opposite end of Main Street, and the Cane Brake cabin has become the Bluegrass Artisan Center. 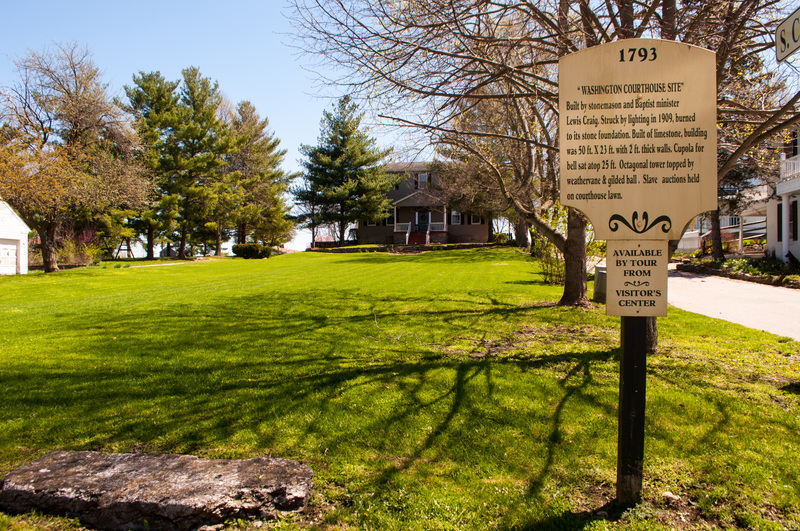 Simon Kenton never lived in the cabin named for him, but he did once own a store in the town and sold the land for the town to its original settlers. The town still honors its earliest explorer the third weekend in September with the Simon Kenton Festival. The Methodist Episcopal Church split over the issue of slavery and didn’t reunite until over 100 years later. Much of the advertised history of Washington relates to the Civil War and Underground Railroad. As a border state, Kentucky tried to stay neutral and act as a liaison between the two sides. But just as this approach didn’t work for the state, staying neutral didn’t work at the town level, either. The debate trickled into a church congregation and ripped it apart. In 1845, the Methodist Episcopal Church in Washington split over the issue of slavery. The congregation in Washington became the Methodist Episcopal Church South and had a separate slave gallery that was removed in the 1970s, according to the inscription outside the building. The Methodist Episcopal Church North relocated to Third Street in Maysville. More than 100 years later, the congregations reunited as the Trinity United Methodist Church. This house sheltered two men who both attended Washington Presbyterian Church, West Point and then fought on opposite sides of the Battle of Shiloh in the Civil War. Nowhere is there a better example of the divide in Kentucky than the Albert Sydney Johnston House on Court Street. This quiet, white dwelling housed two men who eventually faced each other on opposite sides of the Civil War. Johnston, the home’s namesake, spent time in the United States Army before retiring to join the Texas Army. 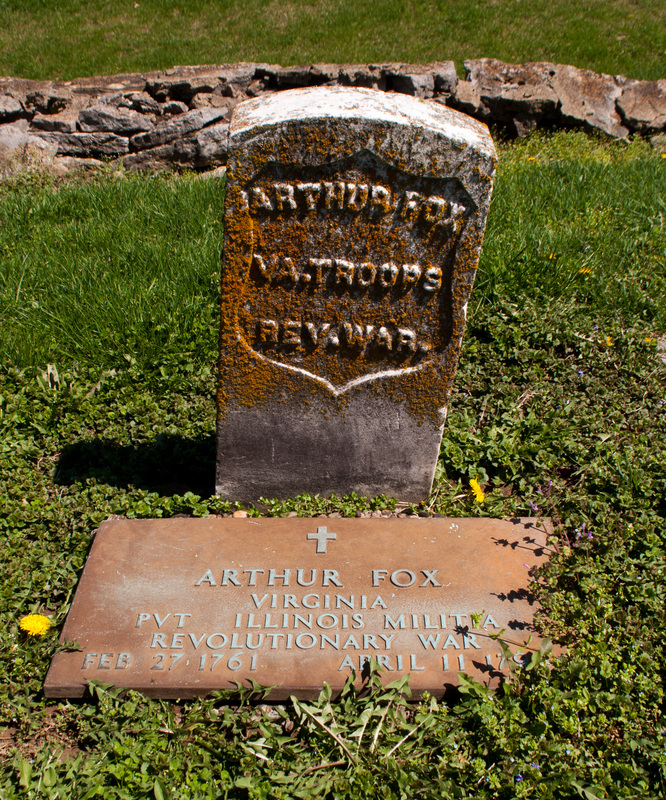 He then returned to the U.S. Army only to again retire to join the Confederacy. He became a general in the Confederate Army, taking a mortal wound early at the Battle of Shiloh. Also fighting at the Battle of Shiloh was Union General William “Bull” Nelson. His family took up residence in this house after Johnston’s father died. Both men attended the same Presbyterian Church in Washington, both men attended West Point and both men fought at the Battle of Shiloh. But where Johnston’s story ends there, Nelson’s continues until his murder in 1862. Nelson was known for publicly disciplining his officers. One of them, General Jefferson C. Davis – not to be confused with Confederate President Jefferson Davis – gunned him down in a hotel after one of these public disciplinary sessions by Nelson some time before. Davis admitted to the murder, but was not charged or arrested and went back to duty about two weeks after the incident. One of the things Washington is best known for isn’t a resident, but a famous visitor. Harriet Beecher Stowe visited the town before she was married. At the time she was teaching in Cincinnati, and came to the small town to visit one of her students. While in Washington, she witnessed a slave auction on the Old Courthouse Lawn. The Harriet Beecher Stowe Slavery to Freedom Museum was established in the Marshall Key house, where Stowe stayed while she visited. The sight stayed with her and was one of the experiences that influenced “Uncle Tom’s Cabin.” The courthouse burned down in 1909 after being struck by lightning. Today, the only thing to mark the dark history of the spot is the sign commemorating the Old Courthouse. While she was visiting, Stowe stayed at the Marshall Key house. Key was nephew to Supreme Court Justice John Marshall. 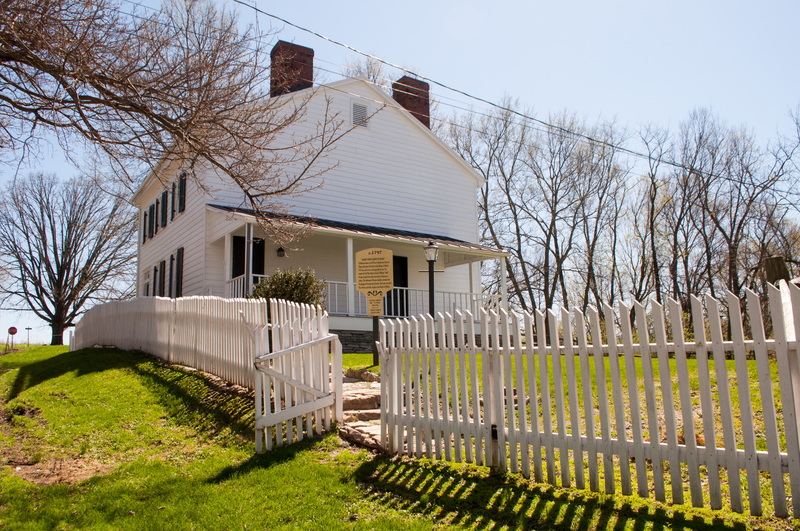 Today, the home has been converted to the Harriet Beecher Stowe Slavery to Freedom Museum and is available to tour. The Paxton Inn (right) has a secret stairwell that was used in the Underground Railroad. Northern Kentucky’s position along the Ohio River lent itself to several stops for the Underground Railroad. At least one of these stops was in Washington in the Paxton Inn. 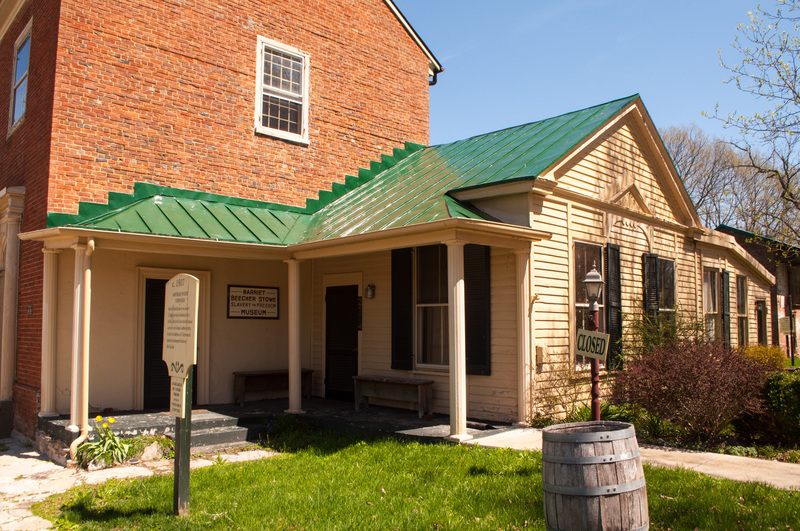 This Inn also served as an important community center where meetings were held to discuss important issues, including slavery. There is a secret stairway between the first and second floors where people could be hidden until they were moved across the Ohio River. I wonder if Underground Railroad passengers ever overheard one of these debates while they were in hiding? One of my favorite Washington characters didn’t make the cut for the sign. Even though Washington was host to some impressive visitors in its heyday, one of my favorite characters of the town would have been overlooked by most of the citizens. His story didn’t even make it to the inscription outside the home. 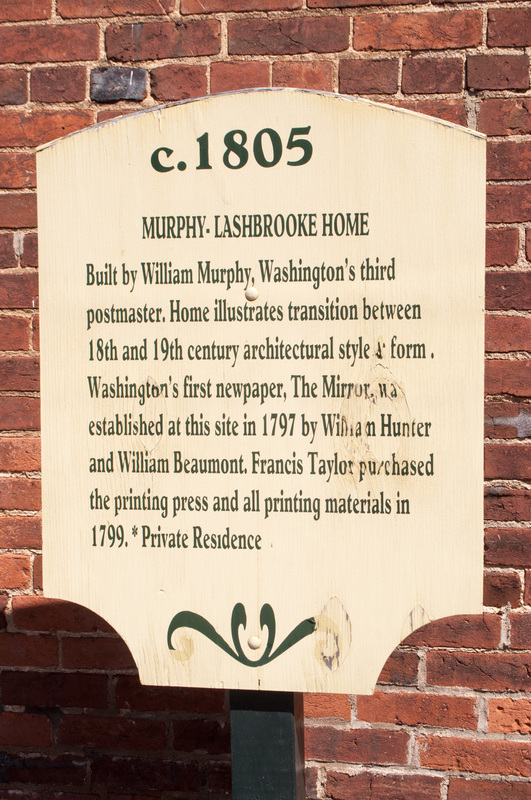 Thornton Blackburn was a slave who served in the Murphy-Lashbrooke house on Main Street. He was sold, eventually ending up in Louisville, where he escaped with his wife and fled along the Underground Railroad to Detroit. They lived there for about two years before being discovered and arrested in 1834. Detroit’s first race riot broke out while they were incarcerated, giving the Blackburn’s enough cover to escape from the city into Canada. Once in Canada, slave hunters again located the couple and tried to arrest them and have them extradited to the States. But Canada refused to release the couple to United States custody, determining a person cannot steal himself, and establishing case law that determined once a slave set foot on Canadian soil he or she became a free man or woman. The Blackburn’s earned a very American ending to their Canadian story. In Toronto, the Blackburns helped many slaves reach freedom in Canada, thanks to the law they helped create. They built a prosperous, influential life for themselves in Toronto. Blackburn became a successful businessman when he established the city’s first cab service. He chose yellow and red for his cab’s color scheme, and Toronto kept this when they adopted city transportation. At the beginning of this story I promised that Washington residents had a worldwide impact. So far, we’ve talked about the Civil War and slavery issues stretching into Canada. Now, I’m going to shift focus a bit – to Pakistan. I’m told there are ruins of a house on a golf course in Washington, but I haven’t found them. These ruins are what’s left of the former residence of Charles William Forman, a hemp farmer turned missionary to India. Forman tried to establish a mission to the slaves in Washington before leaving to attend the Centre College in Kentucky and then the Princeton Theological Seminary in New Jersey. Forman settled in Lahore, India (now part of Pakistan). There, he established an English-speaking school, Rang Mahal School. The school added a college in 1865, and Forman continued helping develop the education system in the area. The college in Lahore, now known as the Forman Christian College, has produced many notable alumni, including former Prime Ministers of both Pakistan and India, Pakistani and Indian senate members and presidents, diplomats, judiciary members, athletes, artists, military officers, journalists and business people. Now, who among you would have thought that a hemp farmer from Kentucky would have helped create an education system half a world away? Be honest, now. The Washington Presbyterian Church was the second one established in the city. I know there is much and more I missed in my self-guided tour of Washington. If anyone reading has a place, story or anecdote to share, please comment below. I’d love to hear more about the town. Some of the information in this post came from the washingtonky.com website, but this site is not sponsored by Historic Washington or Maysville and does not appear to have been updated in quite some time. According to the women working in the Visitor’s Center the day I was there, this site was put together by one of the residents of the town. It lists several community events – including a Chocolate Festival – which the village no longer offers. My hosts explained that they had too many events and it was too much for the town and the shop owners to keep up with. The two events that the town still hosts include the Simon Kenton Festival the third weekend in September and the historic Christmas walk the first weekend in December. Plus, historic tours are offered from April through the first week in December. This shop at the corner of Main and Court Street had a wide selection of primitives, Fenton glass and other home decor items. But for the weekends when there aren’t events, there are still several shops to check out in Washington. 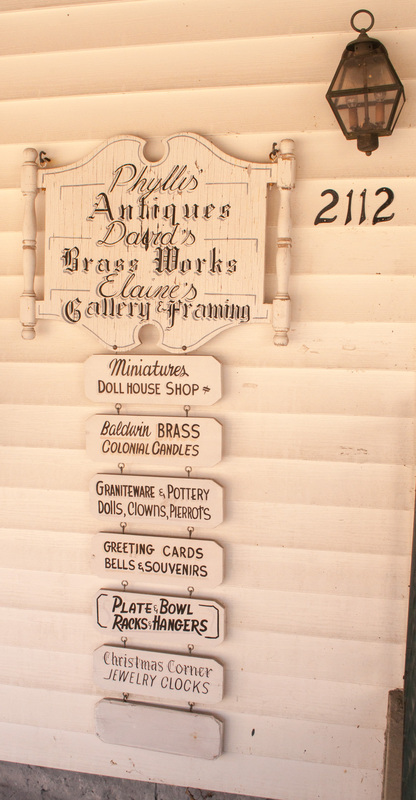 Phyllis’s Antiques, David’s Brass Works and Elaine’s Gallery and Framing sits at the corner of Main and S. Court Street and carries a wide selection of Fenton glass, and everything you see in the picture to the right. The 1790 Rowhouse Mall also contains some retail shopping, and was having a sort-of sidewalk sale the day I visited. My favorite shop was the Strawberry Patch Country Store. It was a store-of-all-sorts with all kind of antique books, keys, tools, baseball cards, electronics, dishes … you name it. Don’t miss the upstairs or the basement. The Strawberry Patch Country Store was loaded with antiques. It was my favorite shop in the town. I did not venture into The Grey Wolf with my backpack full of oxygen; it appeared to have some beautiful items but it was packed wall-to-wall with people. The Iron Gate is next door to The Grey Wolf, but was not open the day I visited. I would encourage a visit to the nearby Baptist Cemetery when you visit the village. It is just south of main street off US 68. There was no sign for the cemetery, but there is the telltale log cabin standing vigil. Honestly, it appears to be about the only thing watching over the graves because many of the markers are falling or have fallen and broken. I gave Historic Washington Village a two on the Gus Scale. The village proper is on relatively flat land and was incredibly easy to walk through. I would have rated it a one if not for the bumpy, though beautiful, flagstone sidewalks. If you’re someone who needs to use wheels to get around you won’t have quite as easy a time as I did. Seeing bison tagged and penned in as if they were cattle didn’t exactly feel like Yellowstone, but it isn’t bad for being more than 1,600 miles away. Its late January and we’ve been getting hit with cold and snow pretty consistently for a couple of months now. Taking the dog for a walk has become an exercise in endurance for both of us — and that’s on the days where she doesn’t just run out, do her business and then make a bee line back to the door. Cabin fever has set in. Don’t get me wrong, I love winter. I would much rather be dealing with temperatures on the southern end of 70 degrees, wind chill or not. Pulling on a pair of thermals under my pants is no big hardship to me. And living in that big, bulky hoodie for a few months? I welcome it. But what do to on those days when you’re tired of being cooped up and you feel like if your dog runs a circle around the room one more time you just might hog-tie her and hang her from the ceiling fan? I slap on one more layer of clothes, grab the long leash and take the dog on some nature trails. 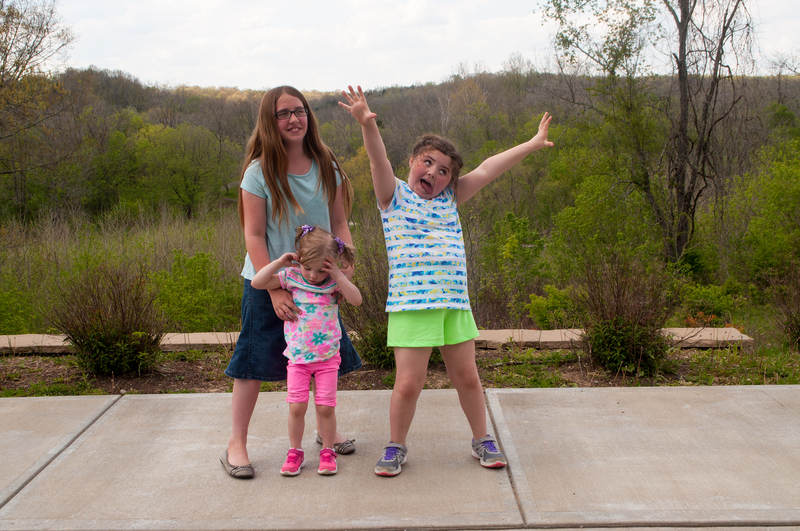 In the spring and summer we love to hit Shawnee Lookout and we’ve been to the Cincinnati Nature Center. But this time I wanted something different. I’ve been looking at pictures from Yellowstone National Park lately and it got me thinking. Why not go see one of Kentucky’s own geological masterpieces? So last weekend we headed to Big Bone Lick State Park. Emme was impatiently trying to drag Dad up the hill going back to the bison pen. All right, we’ll pause here for a minute. Yes, I said Big Bone Lick. I know, so many jokes. I had been living in Kentucky for almost a year before I realized there was such a place. So I asked a friend who grew up here what, exactly, is a big bone lick? “Its … a lick. … A land formation. …I don’t know,” is the response I got. One of the things I love about snow is being able to see the trails that my mutt sniffs out in the woods. So, bright and early last Sunday morning I set out with the dog and my dad to get a little nature and exercise. 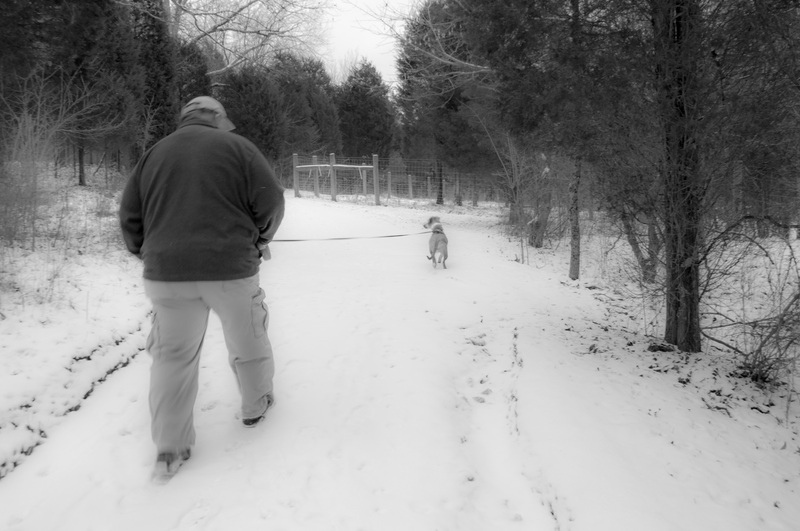 As the humans trudged through the couple of inches of snow on the ground to get back to the bison herd, the hound darted back and forth, taking full advantage of the 16 feet afforded to her by the retractable leash. And I realized another thing to love about snow: It reveals to me the tracks of animals that Emme is attempting to hunt down. Instead of me just rolling my eyes as she runs to and fro, I can see the rabbit and deer tracks crisscrossing the path. 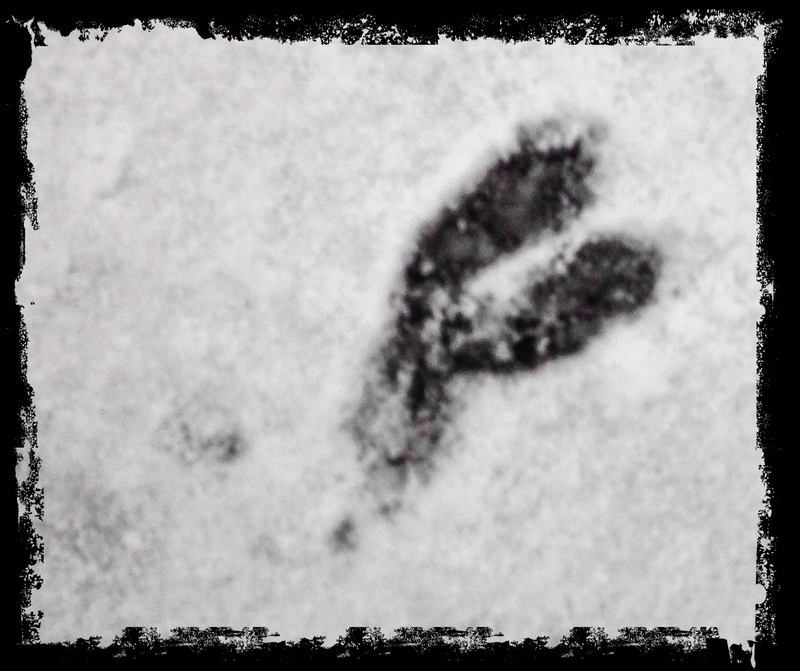 So while Emme busied herself hunting wabbits, I had some fun taking pictures of snow tracks. And of course once we got to the bison, my little 40-pound, hound dog mutt thought she should have a crack at one of them. She barked at the bison, pulled on the leash and pawed at the ground until I swear I saw one of the giant beasts roll his eyes at her. We finally made it to Hannibal, Mo. for our first stop of the trip. We actually made it on the road by 2 p.m. as planned but traffic at some inopportune moments kept holding us back. Everything was going well until we were about 30 minutes from Cohokia Mounds State Historic Site — about 30 minutes from sunset when the park closed. Traffic came to a dead stop and Cory realized we must have hit traffic from an accident he heard some locals talking about at a gas station. 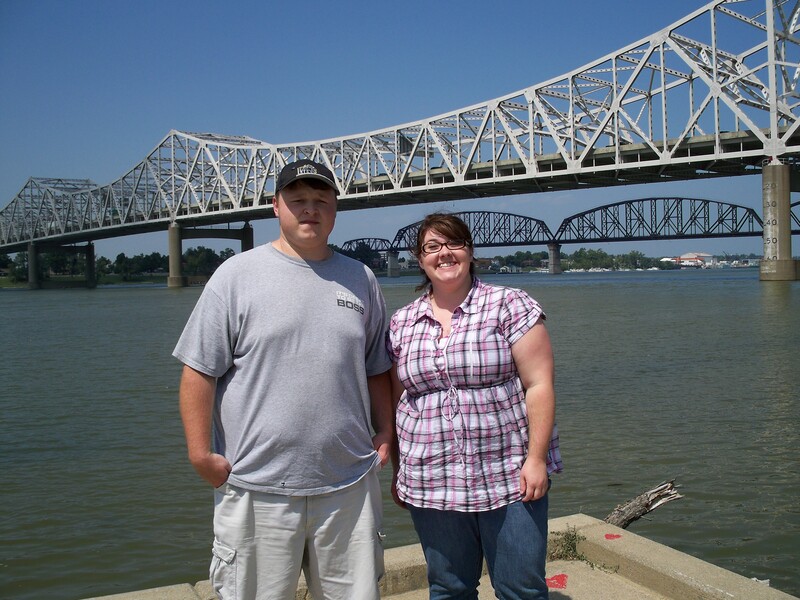 We couldn’t begin our journey without stopping in Louisville to walk along the waterfront – and of course stop for some pictures! We made it to Cohokia Mounds right at dusk. The mounds was the largest Native American city north of Mexico and was inhabited until the 1400s, according to its website. 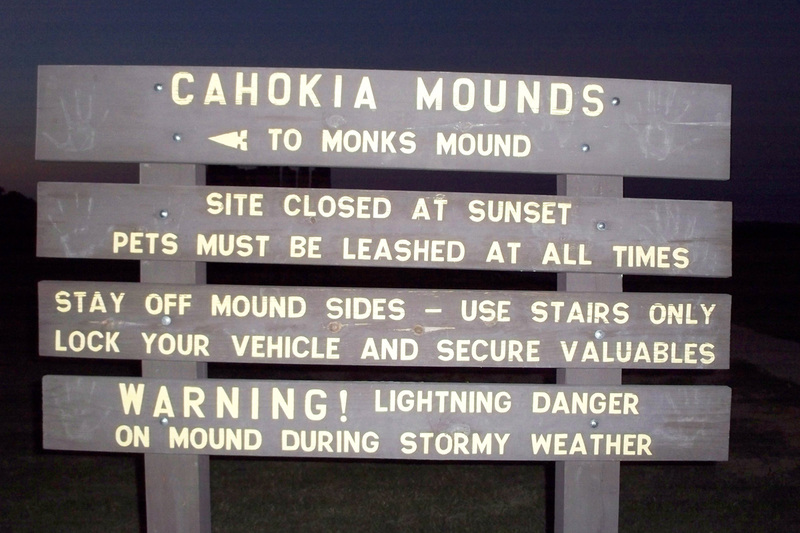 Monk’s Mound, the largest man-made mound in North America, was the only formation we were able to see before the darkness and mosquitoes chased us away. The mound stands 10 stories high, and climbing the stairs rewards you with breath-taking views of the surrounding mounds and even St. Louis in the distance. But now, I really need to crash! We have a long drive through Kansas tomorrow.